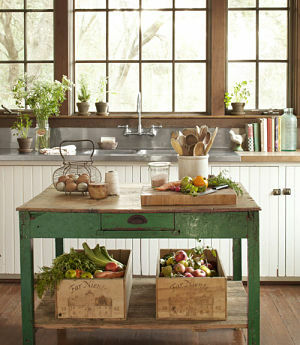 Green and White Kitchen Ideas To Freshen Up Your Kitchen Add to Flipboard Magazine. I am in love with this Green and White Kitchen Idea! 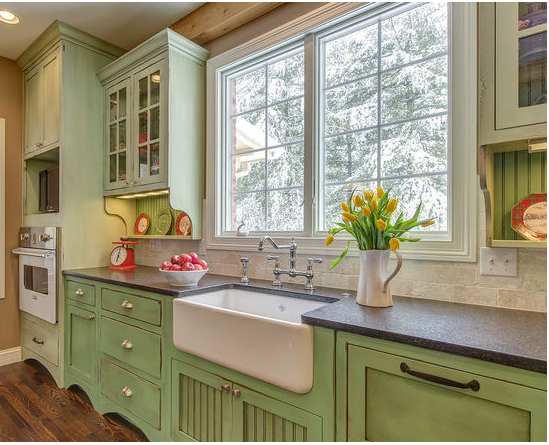 I have decided that it’s time for me to redecorate my kitchen and this beautiful green and white kitchen idea came up when I was searching through Houzz.com. I love the sink and the cabinets. They look vintage or antiqued. Either way…I love it! 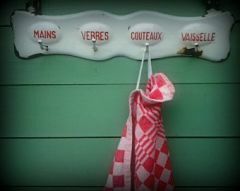 Right now my kitchen is in the Italian Tuscan colors and so are my dishes. I am tired of those colors and I am ready for something new. I have always loved green and white dinnerware and all the other kitchen accessories that go with it. 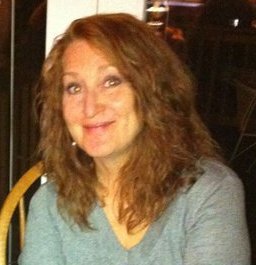 But I also like a POP of color, and orange is my favorite color, so that might be the color I go with. Besides, I have some many things in orange that it will be easy to accessorize my kitchen. 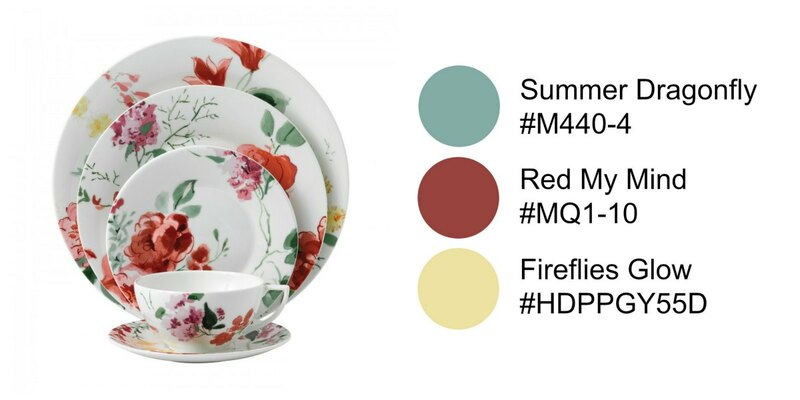 Here are the dishes I have now and 2 options that I really like for a new green and white kitchen. They are both so different, but I love them both. Of course, these aren’t my only choices. 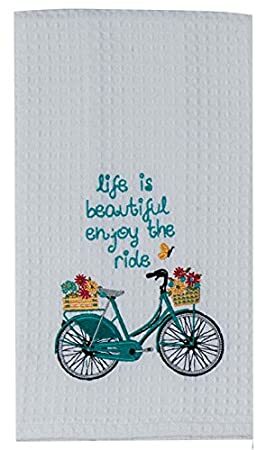 I can’t show you everything that is available in green and white kitchen decor, but you can always click through any product to see what else Amazon has waiting for you. I really like the way they used the green color in the kitchen above. The walls aren’t green at all, just the cabinets. The walls are a nice taupe color called Great Plains Gold from Benjamin Moore…my favorite paint in the whole world. But it’s really expensive, so the paint chips I will show you are from Home Depot….my home town heroes. If you know your color, you can order it online and they will deliver it to your home most of the time. If not, to the store for sure. Sweet! The bead boards on the front of the kitchen sink cabinet and then on the back of the uppers are a great idea. They also continued the bead board inside the upper cabinets and since they have glass doors it really adds another dimension to the kitchen. 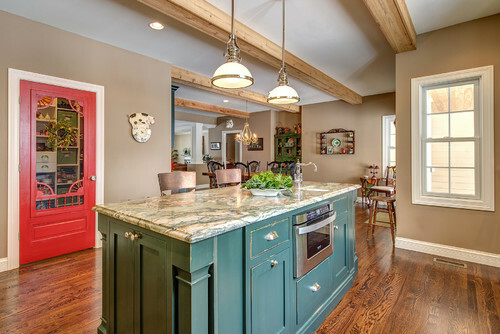 Houzz was nice enough to give us the exact paint colors they used in this kitchen. I am thinking they used on the cabinets Shady Lane and then did a wash of Desert Camel. I could be wrong, but that’s what it looks like to me. I love the outcome. The fact that they used the darker granite for the counter-tops really sets off the farm sink that is in white. The POP of color they chose was red and I love it. Not too much, just enough to make this kitchen so pretty. The wood floor blends in really nice with the darker brown wash on the cabinets. Beautiful job! As I was looking at more pictures of this kitchen I saw this gorgeous pantry door and fell in love with it. Talk about a POP of color! I don’t have a pantry in my kitchen, only a laundry room with a bathroom and I don’t think any of my guests want this as the bathroom door. hehehe Isn’t it awesome? Although, if I had a pantry, I am not sure it would be neat enough to show off every day. Did you also notice that the cabinet color changed in this kitchen when they went to the island? So did the granite. Very interesting. If you are a bit afraid of the color green, but want to still freshen up your kitchen, try painting the kitchen all white and then accenting with green. Notice how well they have done that here. The island that they made out of a household item is really the focus with the green color. You can make your own island out of household furniture as well. Check out some ideas here. They have added a bit more green with plants, books and a few green bottles. What accents would you use? 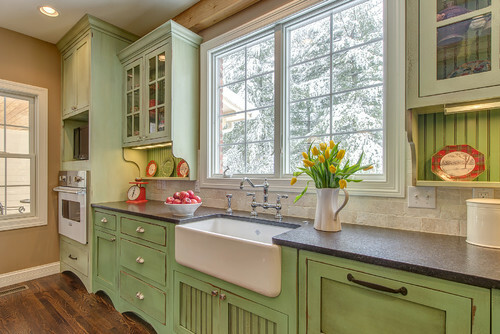 Look around your house to see what green accents you can add for pops of color around your kitchen. You can really choose the green color by looking at what green accents you have around your home and then choose a paint color for your island. 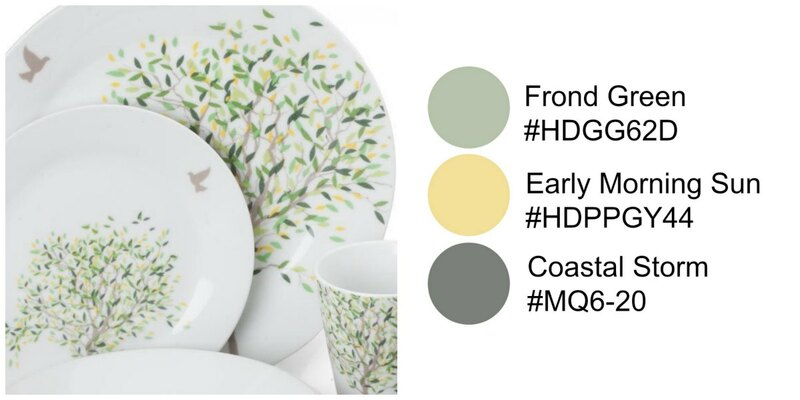 You could also choose your dinnerware first to help choose the green color in your kitchen. For me, it works best to pick my dinnerware out first. Then I know what shade of green I want to paint or accent with. 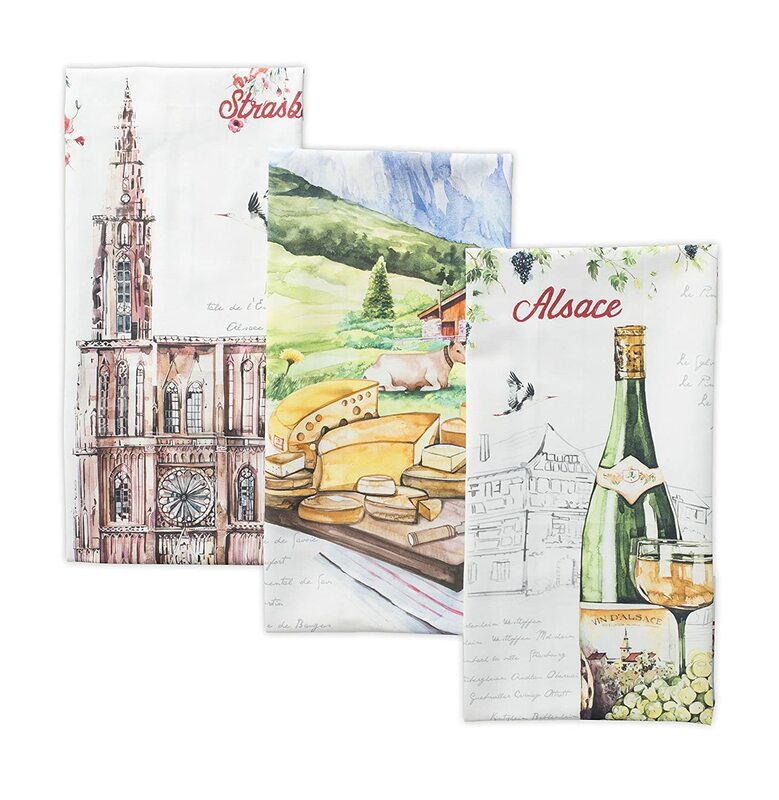 I have chosen several that I think are really pretty and that will complement my kitchen. Now to narrow it down to just one. I might need some help with this one. I really love the simplicity of this dinnerware set by ForTheChef. It has all the colors I like; green, white and yellow. I thought with the grey birds that it might be a really cool idea to do either the entire kitchen in the grey color or just a focal wall. I love when I have options with the dinnerware I am considering. Paisley is something I love and I am not sure why…but why fight it? 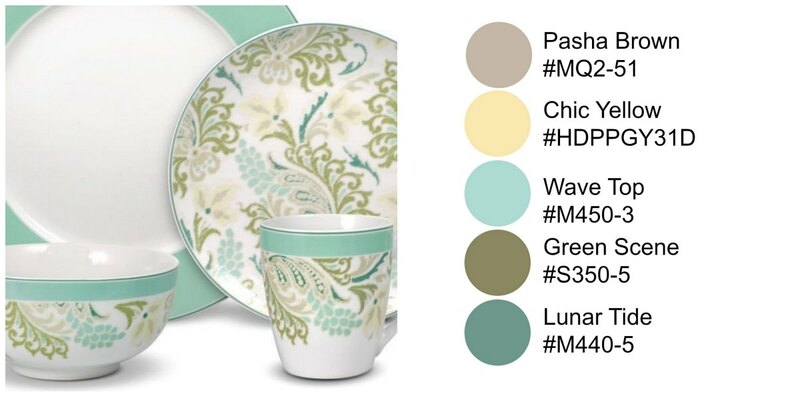 This paisley green and white kitchen dinnerware set appeals to me. The problem is that I see so many great colors in there and many of them are more teal than green that I am not sure. What do you think? Green and White Kitchen or Teal and White Kitchen? This dinnerware set is by Pfaltzgraff. 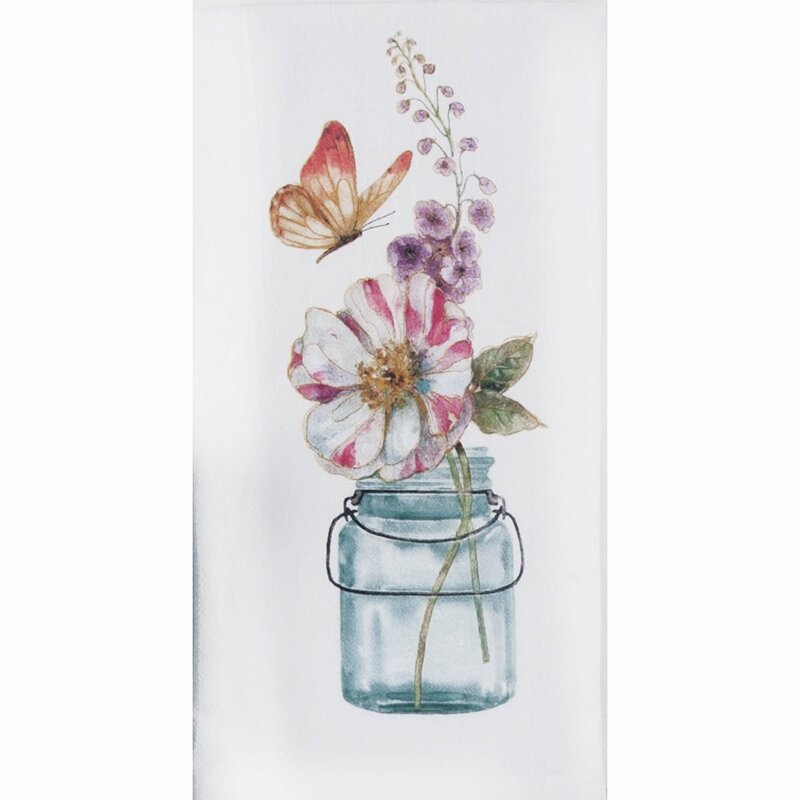 They are well known in the industry and they make dinnerware that lasts the test of time. I like that. I don’t change my dinnerware or my kitchen color very often. I want it to still be in style in 10 years. So this really is perfect for me. Green and White with a POP of color! Wedgwood calls me because I know it is quality and designer patterns. I love this vibrant Jasper Conran design. The pop of red is perfect for my green and white kitchen because you know I love to add an element of POP color. 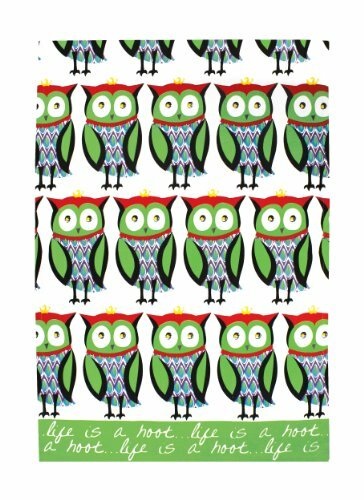 With so many great colors in this design, it will be hard to decide on just one. I have kept my choices to only 3 colors I am looking at and the red isn’t a wall color, so that makes it easier. 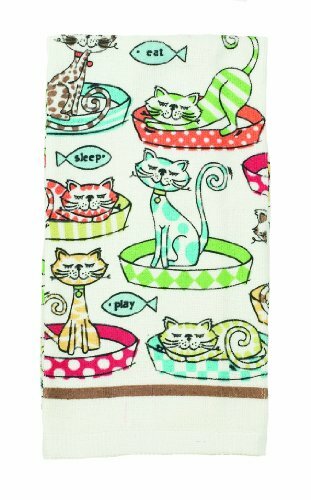 Dish towels hang in my kitchen off the stove handle, so I want them to look good. 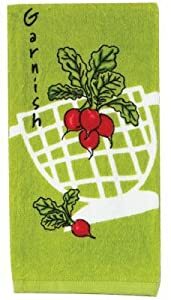 I have some that I bought at a garage sale years ago that are the old flour towels and then someone hand embroidered the days of the week on them with a silly picture. Probably a child did it, it looks that way. But I love them. 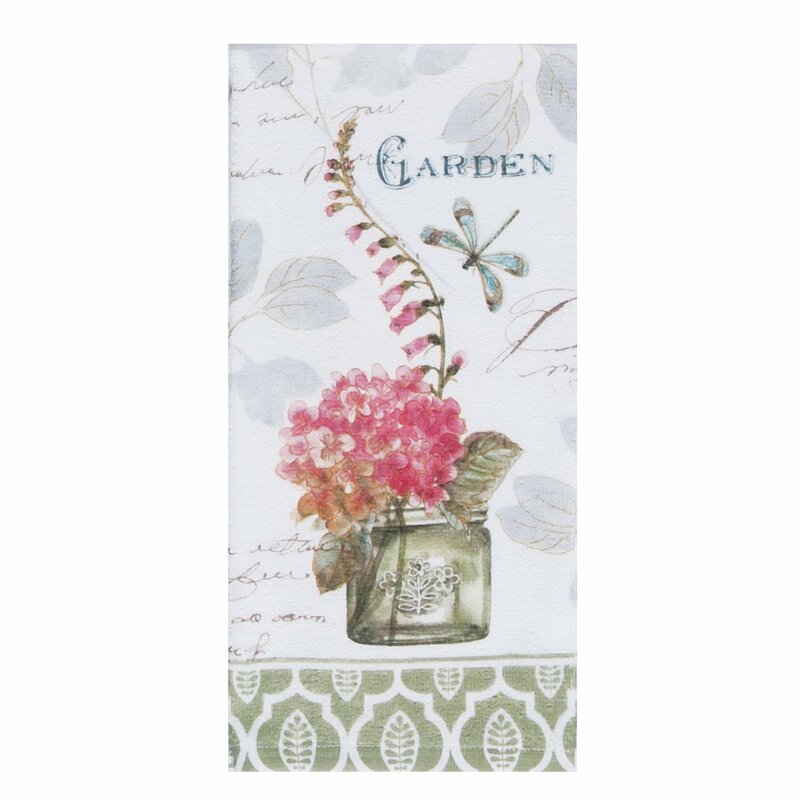 These towels shown here would look great in a green and white kitchen. There you have it. 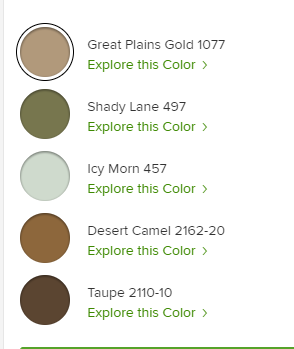 How I decide what color to paint, what dishes to buy and how to decorate. 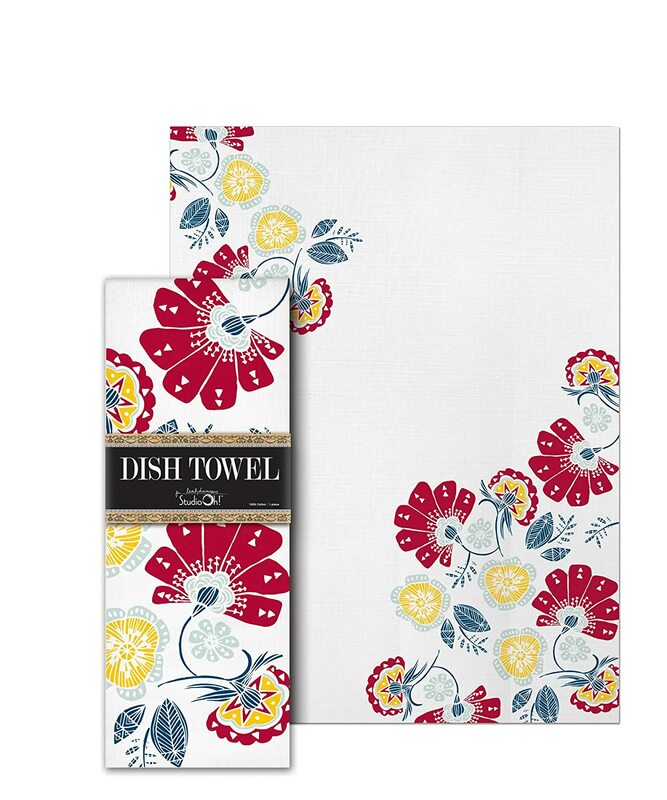 Dinnerware, paint and towels all have to make me happy when I see them. This is important. I hope these green and white kitchen ideas helped you decide if green and white kitchens are for you. If not, maybe Blue and White Kitchen Ideas will strike your fancy…you can find some here. Maybe your true love is Yellow and White Kitchen Ideas, well I have that covered too. Can you tell I have a hard time deciding on the color concept? What do you think of Rooster accents? Check this post out. 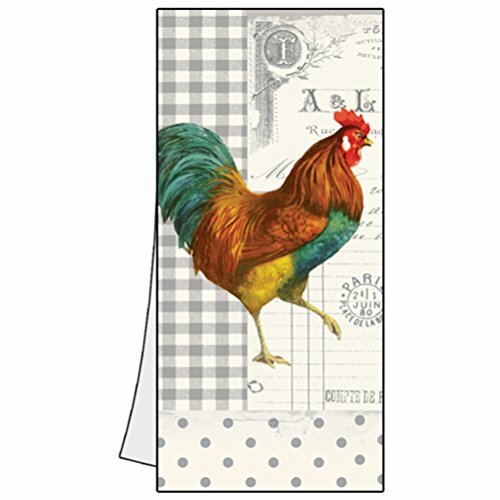 There are so many great rooster things out there and I want them all. Roosters and cows are my weakness. If you still haven’t found the kitchen you love, check out this post with a ton of ideas for kitchen decor.